Another important influence on Chinese thought is the concept of Yin and Yang. This evolved around 300 BC. The period from the 5th to the 3rd centuries BC is known for the development of intellectual activities in China. The creation of the world and the continued processes of nature are attributed to the complementary forces of two powers, Yin and Yang. Yin is the female, passive energy, existing in coldness, night, danger, hardness, evil and death. Yang is the male, active energy in heat, daylight, and life. The procession of natural phenomena was attributed to whichever of the two was in ascendance. Yin and Yang manifested itself in the "chi," the vital energy, and the Five Elements. The five main elements are fire, water, metal, wood, and earth. 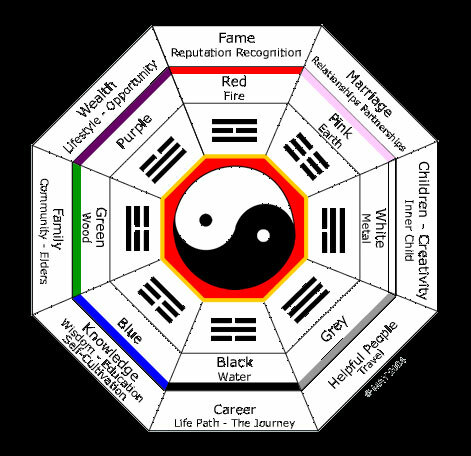 These are associated with other elements in sets of five; the colors red, black, white, green and yellow; the directions south, north, west, east and center; five sacred mountains, the five senses of human perceptions, five fingers of the hand, five toes of the foot. 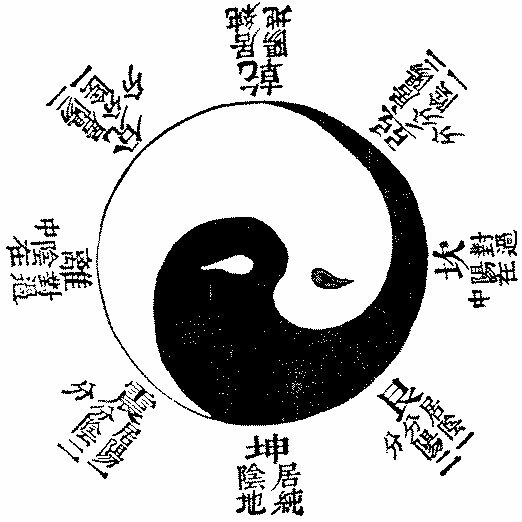 It became fashionable to believe that the proper state of man on earth depended on maintaining the correct balance of Yin and Yang, and the powers of certain members of the Five Elements could help against natural disasters and political disturbance. It began to be used in Han court protocol and for political purpose. The influence of the Yin and Yang was used to require support for whichever faction happened to be on the rise. As it had a powerful hold on the minds of the leaders, they hoped to exert this force on those they led. It can be seen in many aspects of Chinese life. For example, the structure of the ancient cities was based on Yin and Yang. Central buildings were situated on a north-south axis. Since the south symbolized life, all buildings opened to the south. The emperor always sat on the north side, facing south. During the Tang Dynasty, physicians and pharmacologists, not cooks, determined what could or could not be eaten, based on Yin and Yang and the Five Elements. All foods were separated into three categories: the Yin, cool foods that calm and nourish the system; Yang foods that are hot and stimulate the body but deplete energies, and Neutral foods which combine the best features of Yin and Yang for a perfect balance. For example, it was better to eat whole barley rather than milled barley, to have the heating yang effects of the meal and the cooling yin effects of the bran. They advised not to eat leeks with beef or honey, and recommended rhubarb to help a sluggish digestion. Seasonings and ingredients in dishes were chosen to balance the body's vital energies. The Yin and Yang and the Five Elements are also seen as motifs used in decoration of art forms, and religious articles. TIGER	1902, 1914, 1926, 1938, 1950, 1962, 1974, 1986, 1998 Unpredictable, charming, carefree, trusting, often expose themselves to great risks. HORSE	1906, 1918, 1930, 1942, 1954, 1966, 1978, 1990, 2002 Hard-working, determined, sometimes difficult to get along with because they consider themselves superior. 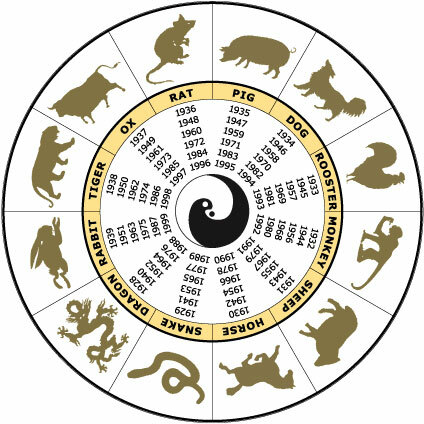 BOAR	1911, 1923, 1935, 1947, Reliable, great thirsts for knowledge, honest, determined, even tempered, perform well under pressure. When you have your Chop (Cheop) (like a stamp or signet, used to sign your work) made, it will frequently include your horoscope sign. 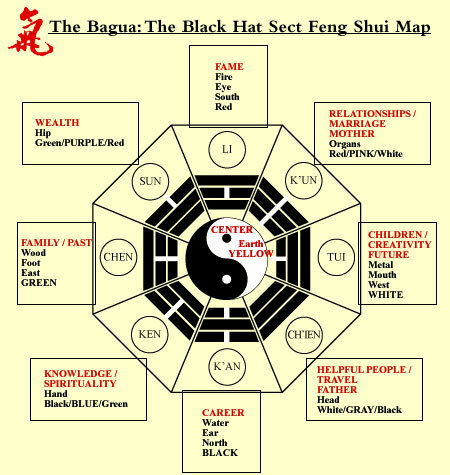 Feng shui is the art and science of positioning manmade structures in harmony with the vital cosmic energy (chi) coursing through the earth. It is quintessentially Chinese in its concern for harmony and proportion, and for balancing man, nature and spirit. Traditional cosmology describes how invisible energy currents, or "dragon Veins," run from the sky down into mountain peaks and then along the earth, blending heavenly and earthly energies. Natural topography - the form of hills, the direction of streams - is believed to modify the natural energies, creating auspicious and inauspicious sites. Feng shui experts study this invisible geography, looking at the positioning of mountains, valleys and streams. Using the Iuo pan compass, a magnetic disc set in a divining board, they scan the hillsides for hidden dragon veins, then follow these down to the valley floor. Sites where yin and yang meet in proper proportions, where "dragon ridges" intersect "tiger hills" - are auspicious locations for villages, houses and ancestral graves. The ideal site faces south, with rising land to the east and softly undulating hills to the west. It has a stream in front and mountains in the back and is open to breezes in front, is dry and has no white ants. Often these sites are used for graves: ancestors must be appeased with the best of everything. Feng shui's ancient principles (the system dates back to the Song dynasty) have been successfully transferred to modern urban environments. Hong Kong is the center of the international feng shui scene, exporting geomancers to Chinese communities around the world. Since poor placement of a building could bring bad luck to both businesses and workers, multimillion-dollar office buildings are vetted by geomancers who adjust their design. When constructing buildings, such as office buildings or hotels, feng shui experts were called in even before the architects' plans are approved. Those buildings having waterfront location are a particularly tricky matters, as dragons are said to sweep down from the hills each day at dawn to bathe in the ocean and would be upset to find their route blocked by a building. Dragons, however, can pass through glass without trouble; so many hotels have high windows and glass doors facing the mountains. Feng shui experts also advised on the placement of doors, windows and elevators inside the hotel, right down to the positioning of room furniture. Feng shui principles influence interior decorating, accounting for the abundance of mirrors inside offices (they scare away demons, who fear the sign of their own ugly faces). Small octagonal mirrors called pat gwa are strategically placed to deflect evil. Aquariums are another solution: the fish' movement and the play of light on the water deflect bad influences. The fish absorb the bad luck, acting as a sort of filter, and if they die, they're replaceable.